Experts claim that 16 VDCs of the district are at high risk of landslides. Among them, they suggest that over 41 settlements in those VDCs need immediate relocation. 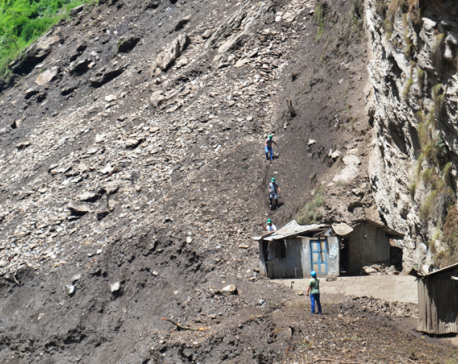 Over 100 families in Jilli and 120 families in Rajali of Badimalika VDC-4 have been affected by the landslides. Police said all the families at risk need speedy relocation. Landslides have also cut off drinking water supply and obstructed various roads in those areas. Road transportation at Martadi and Bamka Bazar has come to a grinding halt. Likewise, a bridge at Khahare River has been badly damaged. Communication lines have also been disrupted. Similarly, Martadi-based Triveni mini hydropower project has has gone out of operation due to damage caused by the flood. Electricity supply to several villages remains disrupted since Saturday. Heavy rainfall has also destroyed crops of over 12 VDCs of the district. There is no trace of the newly-planted paddy crops. Farmers who were delighted for being able to plant the paddy due to timely monsoon feel devastated. A police team has been deployed to assess the damage and the team has yet to collect complete details. “We suspect that property worth millions of rupees has been damaged by the floods and landslides,” said Deputy Superintendent of Police (DSP) Dal Bahadur Bogati, adding that they are still awaiting the report on the damage. The District Disaster Relief Committee (DDRC) has said it could supply some relief materials if demanded.